© Ruth Adler Schee. Photograph by R. H. Hensleigh and Tim Thayer. Ruth Adler Schnee’s artistic career began in Germany where she trained under family friend Paul Klee. After immigrating to the United States, Schnee studied at the Rhode Island School of Design before working with Walter Gropius at Harvard and receiving her MFA under Eliel Saarinen at Cranbrook. 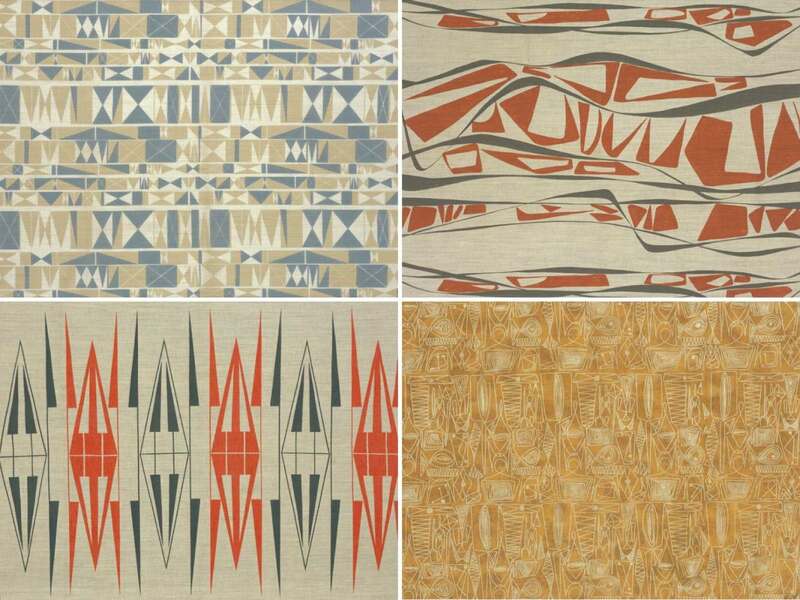 She next collaborated with her husband, Edward Schnee, and formed Adler-Schnee Associates, an interior design firm in Detroit that enabled Schnee to design and produce textiles and the environments that would hold them. Schnee activates her textile designs with organic and geometric forms that appear to undulate and interact with each other. Her work, which resonates with the simple geometric patterns created by postwar Scandinavian designers and the biomorphic shapes of abstract expressionist painting, won awards from the Museum of Modern Art and the American Institute of Decorators. Schnee was inspired by a variety of sources—Germination resulted from her sketches of the American Southwest while on her honeymoon and Wireworks was inspired by firetools designed by Alexander Calder. Many of her designs are once again in production.